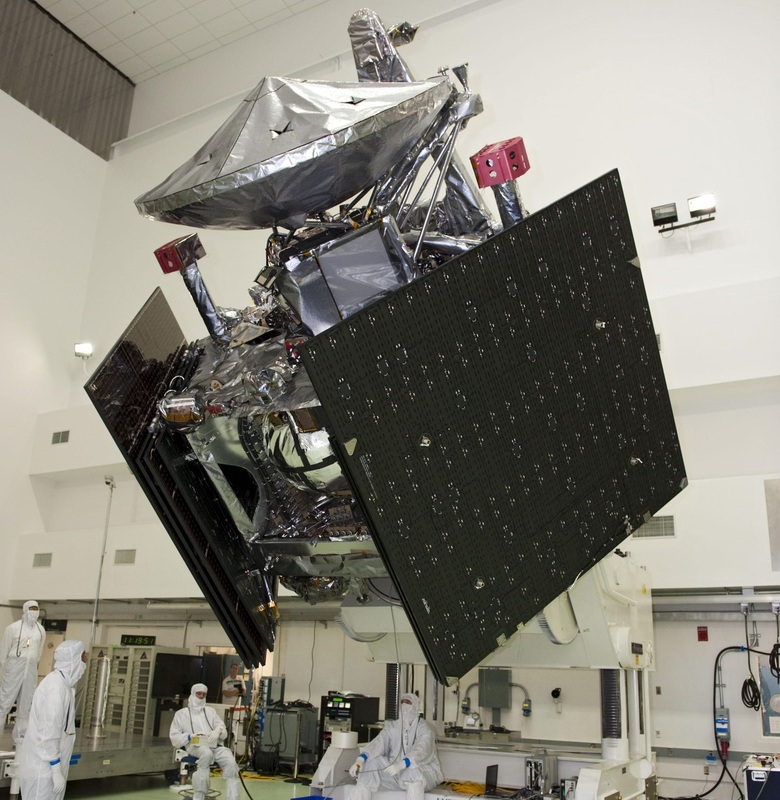 Launched in August 2011, the 3,625-Kilogram spacecraft embarked on a long journey through the solar system, going through a series of Deep Space Maneuvers and performing a close flyby of Earth before entering a two and a half-year cruise to Jupiter. Firing up its main engine in the early hours on July 5 (UTC, July 4 U.S.), Juno will have to hit the brakes to be captured in an elliptical orbit of Jupiter – the mission only has one chance of achieving orbit, there is no backup plan for Juno. The Juno spacecraft is outfitted with nine payloads to unveil the secrets the largest planet in our Solar System holds, orbiting the giant in a polar orbit taking it within 5,000 Kilometers of Jupiter’s cloud tops – ten times close than any previous spacecraft came. 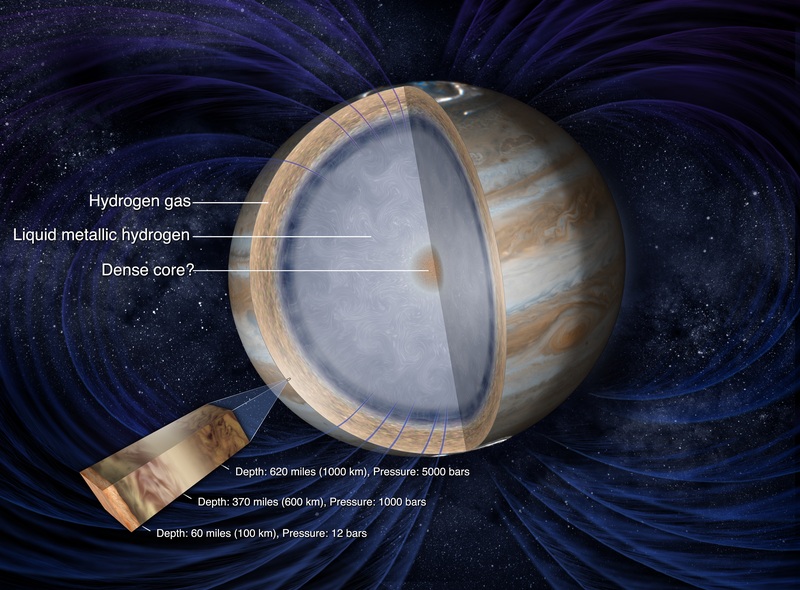 Juno’s primary goal is to improve the current understanding of Jupiter’s formation and evolution. Making 37 laps around the firth planet in the solar system, Juno will precisely map Jupiter’s gravitational and magnetic fields, peer through the thick clouds of the gas giant to study its atmospheric structure, examine whether Jupiter has a solid core, and measure the abundance of a number of constituents including oxygen and hydrogen – a tracer allowing scientists to look back the formation mechanism of Jupiter. Also, Juno will put Einstein’s General Theory of Relativity to the test by studying orbital frame dragging close to a massive body. Pictures of Jupiter will be delivered by JunoCam, an educational payload hosted by the spacecraft. Flying over the previously unexplored poles, Juno will deliver views of uncharted territory in the Solar System. Jupiter – 11 times wider & containing 300 times more mass than Earth – has been a focus of in-depth study via remote observations and spacecraft flybys, however, orbital missions to the Gas Giant have been rare due to the challenging radiation environment when close to the planet. Only the Galileo probe managed to deliver data from Jupiter orbit, launching in 1989 and arriving in 1995 for a mission of close to eight years during which a small probe was dispatched into the Jovian atmosphere, revealing that it was of very different composition than had been believed by scientists. There had been a great desire in the scientific community of sending a spacecraft with modern instruments to Jupiter and the $1.1-billion Juno mission is hoped to achieve exactly that, setting out to complete 33 science orbits around the planet. One of the primary objectives of the Juno mission is sounding Jupiter’s atmosphere, penetrating deep within the dense cloud layers that obstruct the view for every visible imaging instrument. With instrument sensitive in different areas of the electromagnetic spectrum, Juno will map the structure of Jupiter’s atmosphere, constraining to what depth the colorful belts and zones penetrate and measuring the varying composition, temperature, pressure and cloud patterns to unprecedented depths. Peering even deeper, Juno will probe the existence of a possible solid core and measure its mass. Obtaining a complete picture of Jupiter’s current state is of the utmost importance when examining the formation of the solar system because the planet – given its composition rich in helium and hydrogen – formed early and held onto its original composition, providing a window into a distant past. The study of a possible accumulation of heavy elements in Jupiter’s core will revolutionize models of the origin of the planet as well as the entire solar system. Juno will also study Jupiter’s extreme magnetic field caused by metallic hydrogen created due to the immense atmospheric pressure. As a result of the strong magnetic field, Jupiter can claim the brightest auroras in the Solar System. 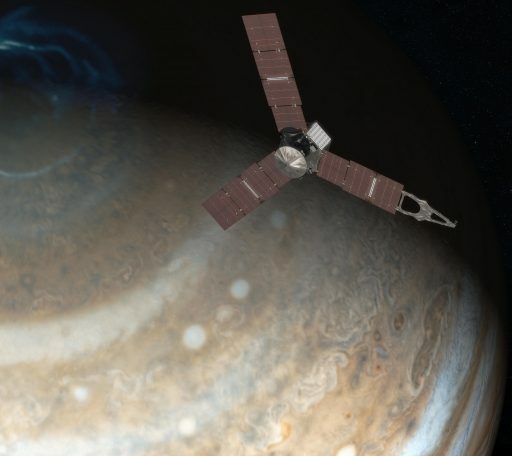 Juno’s instruments will sample the inflow of charged particles responsible for the auroras and also make observations of the light phenomenon itself. This data will further the understanding of objects with similarly strong magnetic fields, such as young stars. 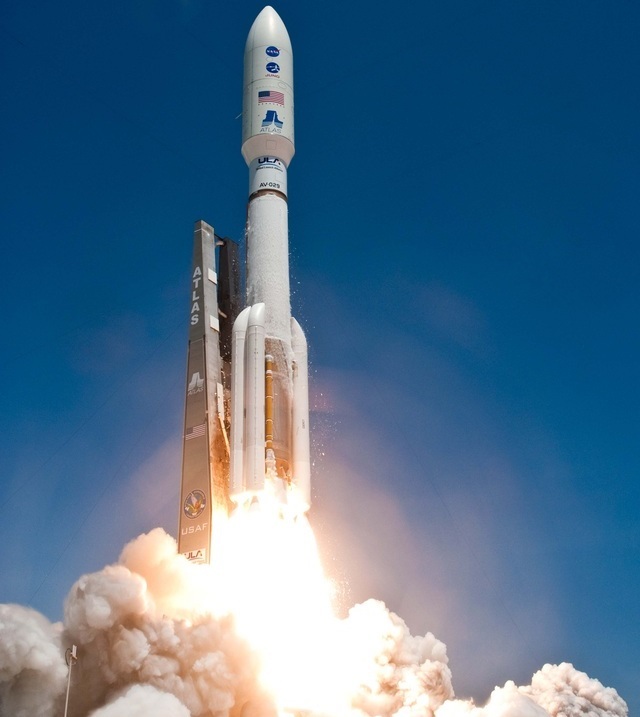 Juno launched on August 5, 2011 from Cape Canaveral Air Force Station, enlisting the help of the most powerful Atlas V rocket on the market outfitted with five Solid Rocket Boosters to catapult the vehicle off the ground. The boosters fired for one and a half minutes, and the powerful RD-180 engine on the first stage continued burning for another three minutes. The trusted Centaur upper stage fired twice to send the spacecraft beyond the grip of Earth’s gravity, into an elliptical heliocentric orbit. 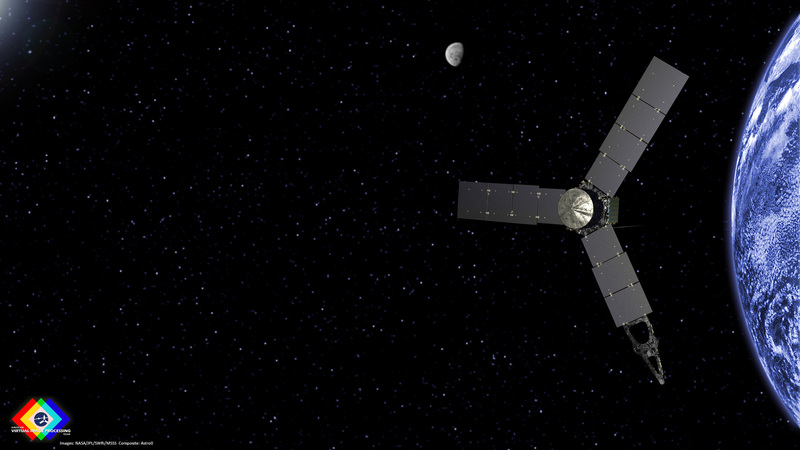 Shortly after separation, the spinning Juno deployed its solar arrays – the largest on any planetary mission to date. Atlas V was right on target, allowing an initial course correction to be canceled and Juno headed into deep space in cruise mode, undergoing detailed systems checks after its turbulent ride into orbit. 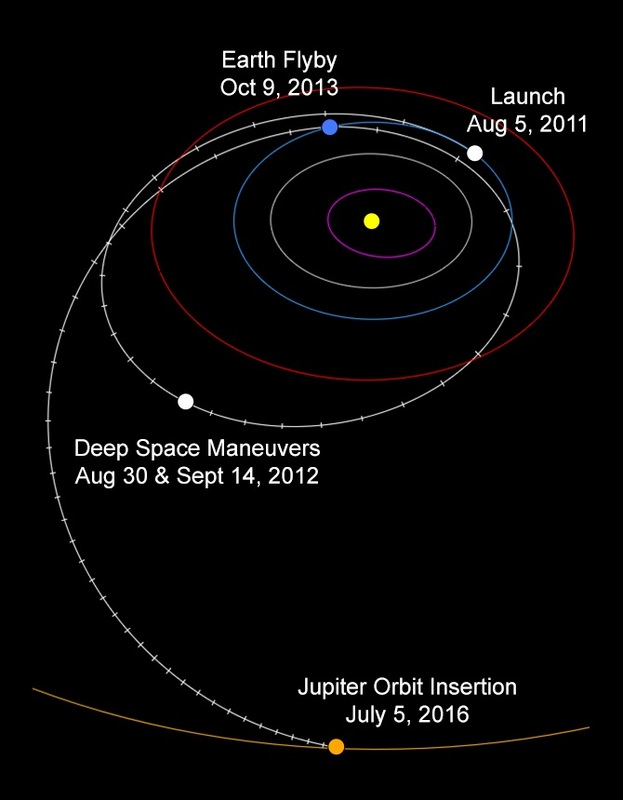 Before the end of 2011, Juno crossed the orbit of Mars followed by a first minor course correction in February 2012 with the first test activation of Juno’s instruments in March. 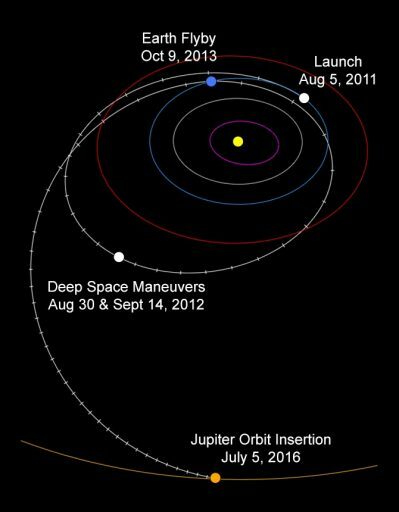 The first mission critical events came in August and September 2012 in the form of a pair of Deep Space Maneuvers. These two maneuvers, taking place at the furthest distance to the sun in Juno’s initial orbit, delivered a total change in velocity of 732 meters per second, requiring Juno’s 645-Newton Leros 1b engine to fire for 29.5 and 30 minutes, respectively. Back on the inbound leg of its orbit, Juno geared up for a close encounter with Earth to borrow some of the Planet’s momentum and slingshot out toward Jupiter. In August 2013, Juno passed the halfway-point in terms of heliocentric distance traveled to Jupiter. Having lost some weight by burning fuel, a 2,870-Kilogram Juno zipped past Earth on October 9, 2013, coming to within 600 Kilometers of the surface to increase its velocity by 7.3 Kilometers. 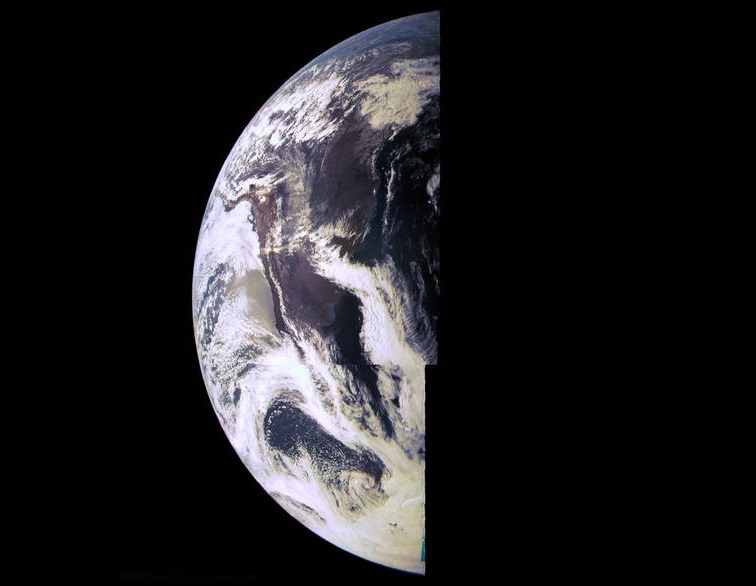 The Flyby was used as an exercise of the spacecraft’s instruments, collecting data when passing Earth including the acquisition of photos by JunoCam. The radio instruments were listening for signals of ‘Hi Juno’ sent by operators around the world and clearly received by the spacecraft as it zoomed past. The Flyby turned out to provide a good exercise to the Mission Team as Juno went into safe mode twice – during the close phase of the gravity-assist and the next time a few days later. Both were caused by minor issues, but provided hands-on experience to the mission team, working out minor kinks with the spacecraft. Leaving Earth in its rear view mirror, Juno headed into the longest of its mission phases – a 2.2-year cruise that began in November 2013 and lasted until January 2016. With one year to go to Jupiter, the mission team approved two significant changes to the mission – the science orbit of the mission was extended from 11 to 14 days in order to obtain a global record of Jupiter in just eight orbits instead of the previously planned 15 – ensuring a global data set is available even in the event the mission ends prematurely. The next eight orbits will fill in the gaps between the first eight and the last 16 will again be placed in the gaps of the first 16 to gather a detailed map of the planet’s gravitational and magnetic fields as well as the atmosphere. A result of the longer science orbit is the science mission being extended to February 2018, running about five months longer, but delivering the same results as per the initial plan. 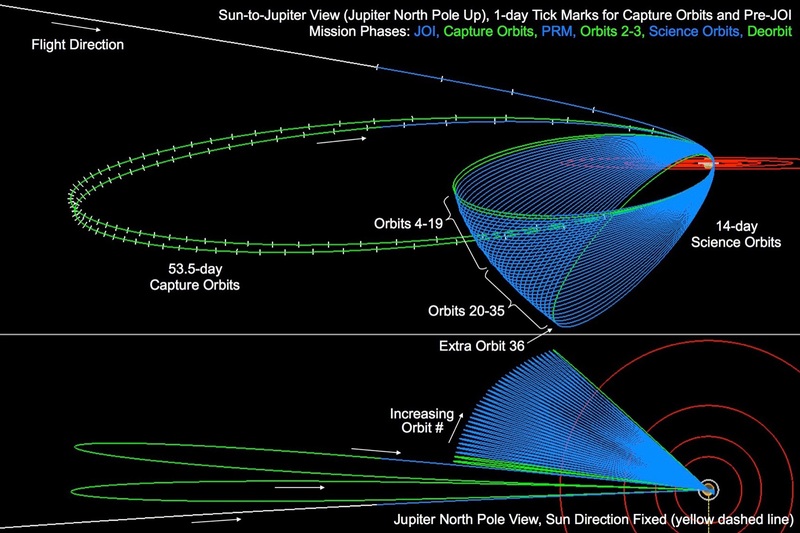 The second change in the planned procedure is the design of the Capture Orbit, Juno’s initial orbits around Jupiter after the critical orbit insertion burn. The initial plan called for a single 107-day capture orbit followed by a Period Reduction Maneuver to lower Juno into its science orbit. Now, the mission will aim for a 53.5-day orbit so that a pair of orbits can be made before the Period Reduction, giving the mission team an opportunity of exercising the science instruments during a low pass over Jupiter’s cloud tops ahead of the formal initiation of the science phase. As Juno closed in on its destination, a campaign began to observe Jupiter with Earth and space-based telescopes to gather data to help put readings by Juno into a broad context. 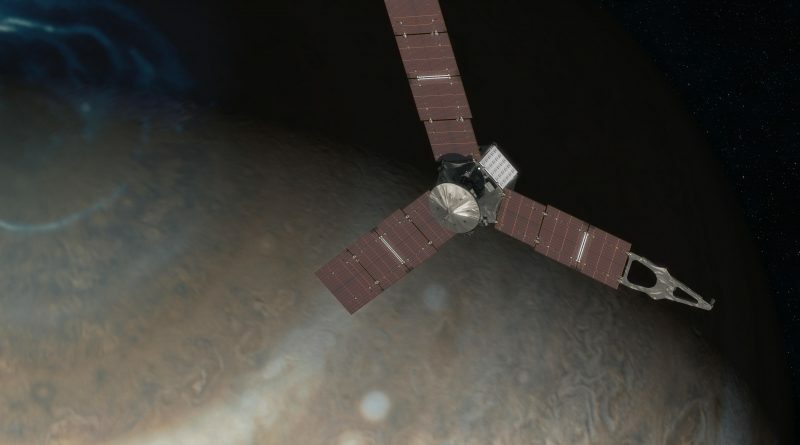 Amateur astronomers have also been asked to observe Jupiter and send their data to the Juno team before, during and after the orbital mission. On January 13 of this year, Juno became the most-distant spacecraft powered purely by solar cells, surpassing the 792-million Kilometer record set by ESA’s Rosetta Comet Explorer currently in the home stretch of its observation campaign at Comet 69P. At Jupiter, sunlight is 25 times less intense than it is at Earth’s distance, resulting in a power generation by Juno’s 18,698 solar cells on the order of 500 Watts. At Earth, Juno would generate a whopping 14 Kilowatts of solar power. 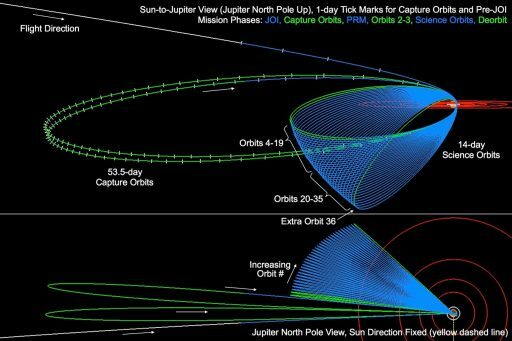 On February 3, the Juno spacecraft conducted a trajectory correction maneuver, changing its speed by only 0.31 meters per second to fine-tune its path to the precisely planned Jupiter Orbit Insertion point. A planned course correction in May was canceled when measurements showed Juno was right on course. Another three maneuvers closer to orbit insertion could also be skipped as Juno continued right on target for its cosmic rendezvous. After over two years in the sun’s influence of gravity, Juno transitioned into the gravitational influence of Jupiter on May 27, being pulled toward the Gas Giant. Jupiter’s significant gravitational pull will accelerate the spacecraft to over 70 Kilometers per second when arriving for its critical insertion maneuver, making the transition into a safe orbit no small feat. 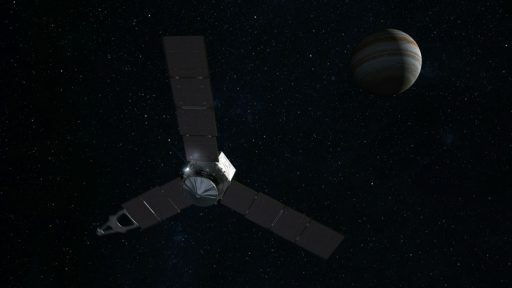 Juno’s orbital appointment is on July 5 at 2:30 UTC – the spacecraft can not afford to miss out on its close pass with Jupiter, there is only one chance to accomplish a safe orbit around the planet with no chance of return in the event of a missed burn. Signals from Juno will travel 48 minutes from Jupiter to Earth with confirmation of main engine start expected at 3:18 UTC, 11:18p.m. EDT, just in time to make the July the Fourth fireworks. 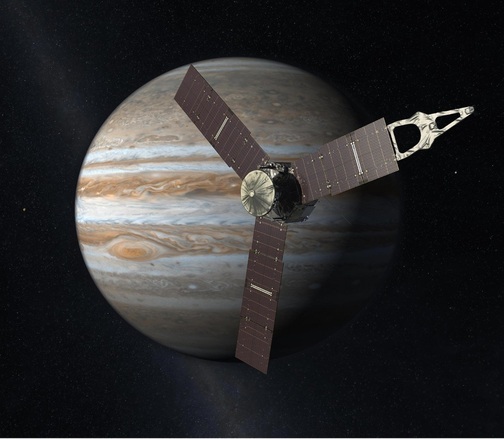 The sequence preparing for Jupiter Orbit Insertion (JOI) started on June 11 when NASA’s Deep Space Network began 24-hour coverage of the spacecraft to enable the Mission Team to keep up to date on spacecraft status and send commands at all times. On June 20, Juno opened up its protective main engine cover that shielded the Leros 1b main engine from micrometeoroids and dust impacts during the five-year travel from Earth to Jupiter. Last Tuesday, JunoCam snapped a photo of Jupiter with its four Galilean Moons. Still at a distance of 11 million Kilometers, Juno Cam could only resolve some details, though Jupiter’s swirling orange and white bands are clearly visible in the image that is part of a timelapse of Juno’s approach. 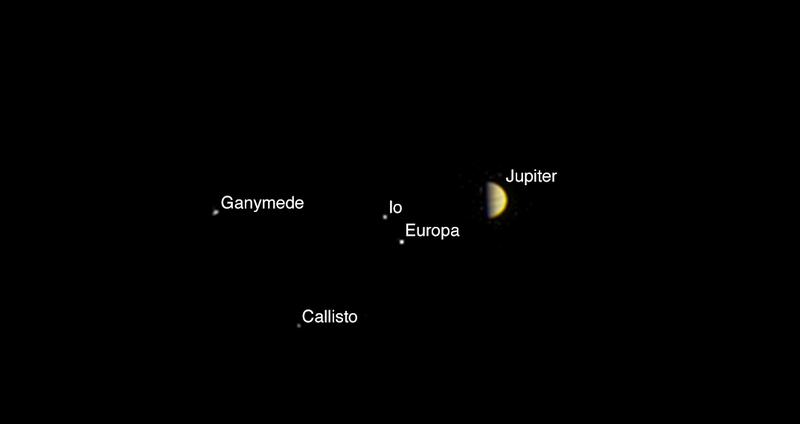 Juno is closing in on the planet from the north pole, offering a unique view of the Jovian system – other spacecraft passed much closer to the equator. On Tuesday, Juno will pressurize its bi-propellant propulsion system to set up for its critical insertion maneuver followed on Wednesday by the deactivation of the science payloads. Only essential equipment will be active during the JOI Phase to minimize the number of systems that could cause an upset and lead to a spacecraft safe mode which would be a very undesirable situation close to a critical mission event. With the parameters for the critical rocket burn already stored aboard the spacecraft, Juno will enter its command sequence for JOI on June 30th – marking the hands-off point for the team on the ground who will only watch over Juno and intervene when absolutely necessary. Setting up for JOI, Juno will switch to its Medium Gain Antenna that has a larger boresight and enables the vehicle to communicate with Earth at greater off-axis angles. Two hours before the maneuver, Juno will begin sending tones – a very basic form of communication as the spacecraft selects from 256 available semaphores, either sending heartbeat tones to signal it is still alive and doing well or transmitting tones corresponding to specific mission events or statuses. At TIG-122 minutes, Juno slews to a 15-degree sun angle to get closer to its burn orientation. The fast turn to the retrograde burn attitude commences at TIG-50 minutes, taking around 15 minutes. Because the Earth moves out of the Medium-Gain Antenna boresight, Juno has to switch to even lower bitrate comms through the Low Gain Antennas at TIG-37 minutes. Beginning at 33 minutes prior to ignition, Juno will be in active nutation dampening to remove residual body rates followed by a six-minute fine-tuning maneuver of its attitude. At TIG-22 minutes, the spacecraft will spin up to a maximum of five revolutions per minute for stabilization during the engine firing. Igniting its 645-Newton Main Engine, Juno will hit the brakes to insert itself into Jovian Orbit by making a 35-minute retrograde burn, coming as close as 4,667 Kilometers to the planet in the process. The engine will consume roughly 785 Kilograms of hypergolic propellants during the maneuver. Juno has to fire for at least 20 minutes to achieve a safe orbit around Jupiter, though the full 35 minutes are needed for the mission to achieve all objectives. Due to the criticality of the maneuver, the spacecraft has a built-in fault detection and recovery system and is capable of autonomously responding to problems occurring during the burn. Should the burn be interrupted for any reason – such as a radiation-related upset, Juno has 500 seconds to rectify the situation and resume its burn to make it into orbit. When the signal confirming ignition of the main engine arrives on Earth at 3:18 UTC on July 5, Juno should already be in a safe orbit, but the nail-biting will still have to continue as data from the burn makes it to Earth. After completion of the burn based on accelerometer readings of the achieved change in velocity, Juno will once again spin down and turn toward the sun for good power generation after relying on its batteries for 103 minutes. Communications with Earth through the Medium Gain Antenna will resume 23 minutes after the end of the burn, though telemetry lock may not be achieved for another 20 minutes or longer. Slowing down by 542 meters per second, Juno will place itself into an orbit taking it around Jupiter once every 53.5 days. Two of these Capture Orbits will be flown with a close passage of Jupiter reserved for an initial test run of the scientific instruments ahead of the critical Period Reduction Maneuver on October 19 that will drop Juno into its 14-day science orbit. The 33 science orbits begin in November 2016 and last until February 2018 when the mission will come to an end. The constraining factor for the Juno mission is the intense radiation within Jupiter’s radiation belts which are far more powerful than Earth’s Van Allen Belts. While spacecraft in Earth orbit are shielded against radiation-related upsets, Juno literally carries a vault. Made from titanium, the 172-Kilogram box contains all critical electronics of the spacecraft, however, a spacecraft near Jupiter can only survive for so long, even with a radiation vault. 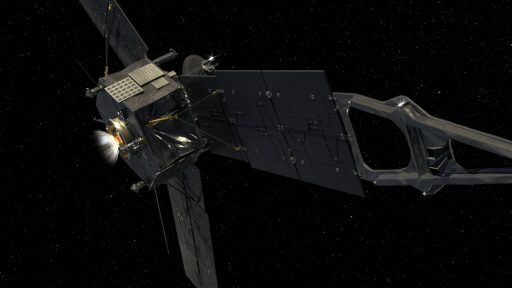 The mission has been set up to capture the most critical data in its first eight orbits so that at least some data is available to scientists should anything go wrong before the scheduled end of Juno’s mission. But before teams can think about the tremendous data set expected from this mission, Juno has to hit the mark to arrive at its distant destination.